As I discussed last week, I lost a lot of my love of Stanley Kubrick over the decades. But I didn’t lose my love for all of his pictures. And amongst my favorites are his first two Hollywood pictures, The Killing and Paths of Glory. Saturday night, I revisited these favorites at the Pacific Film Archive, where they were screened as part of the series Eyes Wide: The Films of Stanley Kubrick. Some historical background: Kubrick started his career with two super-low budget independent features–Fear and Desire and Killer’s Kiss. I saw Fear and Desire some years ago and hated it (Kubrick eventually disowned it), and have never seen Killer’s Kiss. The PFA screened them Thursday night, but I was unable to attend. Although it wasn’t a commercial success, Killer’s Kiss impressed enough people to bring Kubrick into the Hollywood system, albeit on a low budget. United Artists financed and released his next two pictures, The Killing and Paths of Glory. The PFA screened them in reverse order, showing Paths of Glory first. To my mind, this is Kubrick’s masterpiece (with Dr. Strangelove a close second). This World War I tale of ruthless generals and the common foot soldiers they see as disposable pawns, shows Kubrick at his best. His visual flare brings a powerful contrast to the film’s two major settings: the ugly, dirty, and dangerous trenches of the front, and the opulent palace where the generals’ live in comfort and luxury. The story is simple, but powerful. In 1916, with the war at a long stalemate, two French generals (Adolphe Menjou and George Macready) decide to take a German position that everyone knows can’t be taken. With little time to prepare and almost no support, the men leap out of their trenches and attack–only to be mowed down. The survivors understandably run back to their trenches. Unable to admit that their plan was impossible, the generals order that three men be arrested as examples, tried for cowardice, found guilty, and shot. Before Saturday night, I had last seen Paths of Glory on a rented, Criterion Blu-ray about a year ago. I don’t remember when I last saw it theatrically, but I think it was in the 1980s. Paths of Glory is one of the rare Kubrick films that allows us to care about the characters. This is especially true with the three condemned "examples," charged for failing an impossible task and knowing without a doubt that they will be executed. Each was chosen by their superior officer. One of them, played by Ralph Meeker, knows that his truly cowardly lieutenant (Wayne Morris) has reasons for wanting him dead. Kubrick generally avoided heroes, but he got one in Paths of Glory–Kirk Douglas as Colonel Dax–the lawyer-turned officer who leads the charge and becomes the men’s defense attorney. Douglas was the first big star to appear in a Kubrick film, and he probably demanded a rewrite to make his part larger and more noble. In a late scene, he angrily tells off a top-ranking general, calling him a "degenerate" and promising that "I’ll go to Hell before I ever apologize to you again." Kubrick generally avoided such moral preaching. Kubrick’s visual sense comes to fully glory here. Tracking shots through the trenches help illustrate the claustrophobic, horrific nature of men’s predicament. Another tracking shot, leading up to the executions, help emphasize the ritual aspects of these legal and ceremonial murders. The court martial, or perhaps I should say the kangaroo court martial, is set in an opulent room whose floor suggest a chessboard. World War I produced more great films than any other war. This is one of the best. It’s hardly surprising that a young filmmaker breaking into Hollywood in 1956 would start with a noir. After all, these gritty crime films were cheap to make and popular with audiences. But The Killing proved to be one of the best of the genre. 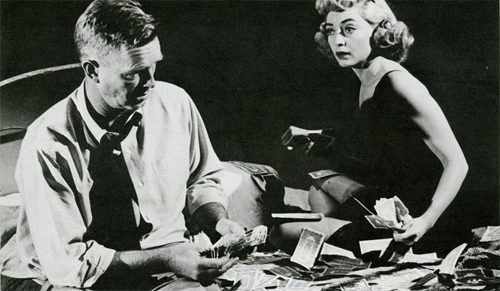 In this classic heist thriller, an experienced criminal (Sterling Hayden) orchestrates a complex racetrack robbery likely to net two million 1956 dollars. Of course, he needs collaborators. And each one of them has to do his job at the exact right time for everything to work. Needless to say, human frailty is going to get in the way. Hayden’s Johnny Clay is a professional, but most of his collaborators are breaking the law for the first time, motivated by a desperate need for money. The most heartbreaking is Joe Sawyer’s racetrack bartender, who needs money to help the very sick wife he loves so much. But Elisha Cook Jr.’s character is a different kind of marriage problem. He hopes that if he had more money, his dreadful, scornful, adulterous wife (Marie Windsor) might actually love him. We feel little sympathy for Cook’s character, and none at all for Windsor’s, but these two are clearly the most entertaining people in the story. When Clay meets that awful wife, he sees her for exactly what she is. "You’ve got a great big dollar sign there where most women have a heart." As it should be, The Killing is filled with such snappy, pulp-heavy dialog–probably written by Thompson. In hiring a sharpshooter, Clay argues that the risks are limited. "You’d be killing a horse – that’s not first degree murder, in fact it’s not murder at all, in fact I don’t know what it is." Hayden’s rat-a-tat-tat delivery makes that like explosive and funny. Before Saturday night, I had last seen The Killing at the UC Theater, probably in1996 or 1997. I was glad to remake its acquaintance. Both movies were made by United Artists after 1951, which means that they’re now owned by MGM/UA. But MGM/UA no longer distributes its own films. Criterion has released both of these films for home use. Other UA titles have been released on video by Fox and Kino. A company I’d never heard of, Park Circus, now distributes these two titles theatrically on DCP. Both films started with a Park Circus logo, and then the MGM lion. Every UA film, no matter who distributes it, now starts with the MGM lion–even though none of them are real MGM films. And that lion is in color, even before a black and white film. Other than that, this were excellent transfers. Whoever supervised the digital mastering respected the film look and the grain structure. They kept the original mono soundtracks, without trying to convert them to 5.1. Both movies looked and sounded great, and still felt like works of their time. Thanks, Lea. Interesting article, although I disagree with the author on Barry Lyndon.